Here’s the updated table to reflect yesterday’s action. Please note the “Days 1-3” data reflects the high price during the first three days after each decline, regardless of which day it falls on. I also included a Days 1-10 column to reflect the high price during the first ten days; it also shows the number of trading days (post decline) required to produce that high. A couple of interesting things popped out of the additional study. First, five or more declining days in a row is even more rare, occurring only 5 times since the Oct 07 highs (now 6). Previous 5th day declines were 2, 5, 8, 15 and 61 points, so yesterday’s 1.37 was the lowest yet. Now, of those five previous 5-day declines, only three went on to decline a 6th day. They’re seen in the table as the periods ending 10/10/08, 2/23/09 and 7/2/10. The first two occurred in the midst of the biggest bear market in years. The next few days in the 10/10 period were -4, -78, -3, +90 and up an intraday 44 on the last day before closing down again. 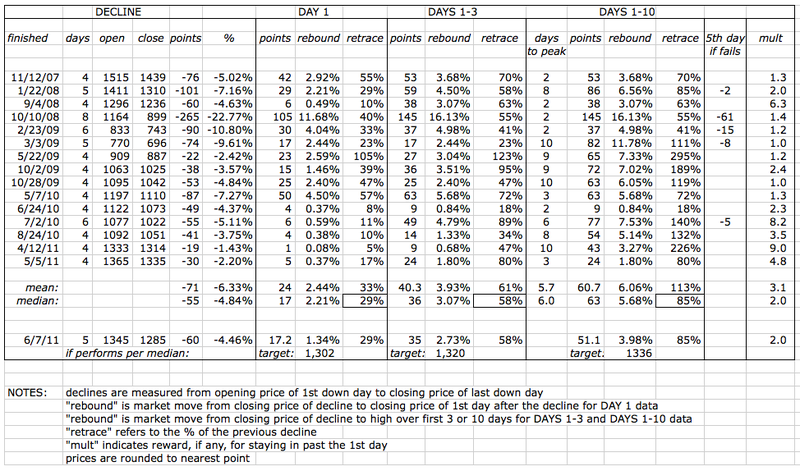 The 2/23 period resulted in a 40 point drop on the 6th day, followed by a 28 point gain on the 7th. Both these periods hit an intraday high on the 2nd post-decline day before resuming their bearish trend. 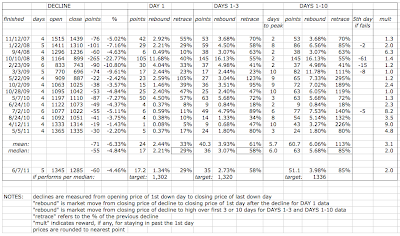 The 6th day in the 7/2/10 period started off down 4, raced back up 14 points, then fell back to close down 3 cents. But, the next five days saw a rebound that retraced the entire decline and then some (140%). There were two other declines that ended after 5 days. The 1/22/08 period retraced 29%, 58% and 85% in the 1-day, 3-day and 10-day periods respectively. The peak was on the 8th day. The 7/2/10 period retraced 23%, 23% and 111% and peaked on the 10th day. In general, 2nd and 8th days were important in terms of retracement highs. They accounted for over half of all the periods. An intraday high frequently occurred on the 2nd day post-decline when the market was tanking. Retracements following declines in upward-trending markets usually benefited from the extra days of market advances. Now, if you haven’t dozed off yet, the really cool stuff. The @ symbol marks each of the 4+ consecutive day declines since the 2007 highs. See anything interesting? Great point. Especially if you look at the weekly numbers — they look especially bearish. 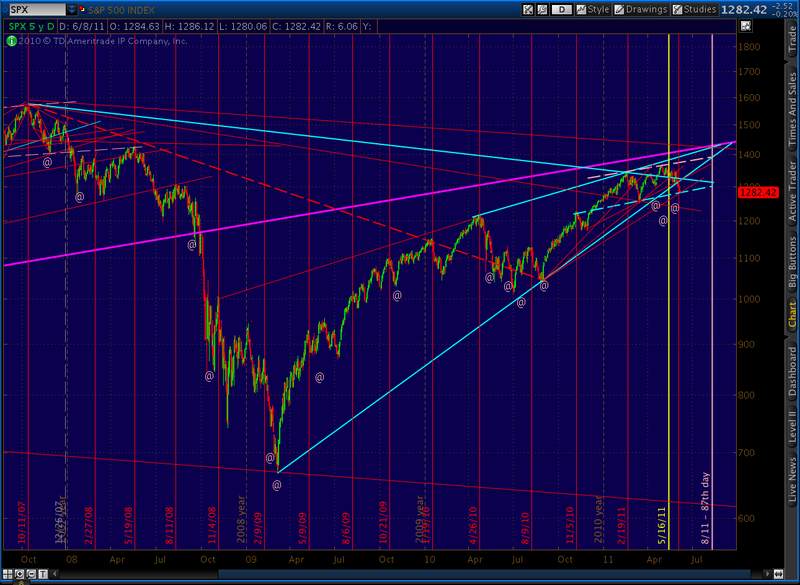 I'm not looking for a resumption of the bull here, just one last pop before the serious carnage. And, I don't consider the case strong enough to bet the farm on the upside. More like a cautionary message for the "bet the farm on the downside" folks. Wow.. thanks. One thing about last summer (May June and July's) 3 occurances — the flash crash reset the MACD very low, so that by the third occurance it was rising strongly from a deep oversold condition. Now, it is still falling (no flash crash, just controlled selling). When they occurred in close proximity to one another, they marked not just short-term but medium-term reversals. 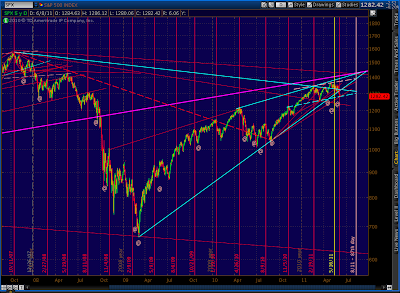 Notice, in particular, the March '09 and July '10 bottoms. While there's always the possibility that this current downturn will accelerate, we've had three of these since April, which makes me think we are due for at least a meaningful bounce. I don't. Can you clue me in?